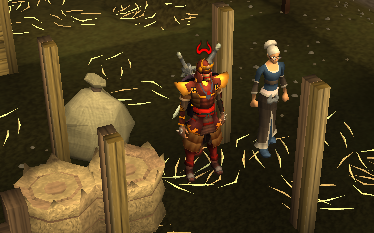 Start out by going to the barn northeast of Draynor Village, and talk to Mabel. Ask Mabel what's wrong and she'll tell you she left her ring upstairs in the barn and ask if you can get it for her. Say you will and go up the ladder. You'll find that you can't just go and get the ring, you'll have to push the hay bales around to get to it. Refer to the above picture on how to move them. 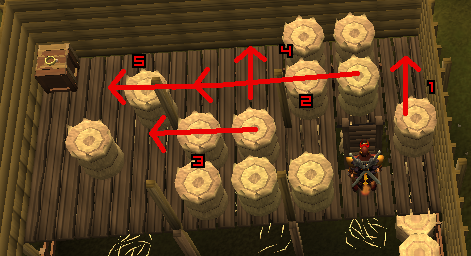 In this puzzle, you can move up to two bales of hay, but not three. Start by moving the first hay bale to the northwest corner of the room. Then move the two bales of hay all the way South to the next bale of hay. Move the other two bales of hay south so you can get to one of the bales of hay. Push the top bale of hay that's in a line of three to the west so you can move the other two bales of hay. Now go grab the ring. When you grab the ring you'll hear some explosions from outside the barn. Head downstairs, and Mabel will be in a sack, and a lady named Zenevivia will be there. Talk to her and she'll take Mabel's ring. Ask what she has done with Mabel, and she'll ask you for a favor, so ask her what she wants. 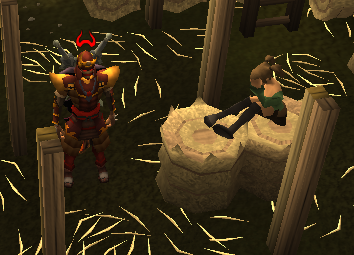 She tells you that inside one of the hay bales, is a twig, and she wants you to get it for her. Check the southwestern hay bale in the barn and you'll find it. Give it to her, then talk to her. She wants you to get another twig, so go to the hay bale and grab another so you can give it to her. After that, talk to her again and ask if you get a reward. She goes on to talk about how she hates adventurers, and how she started watching you in your adventures after the Wise Old Man retired from adventuring. She wants to challenge you and the Wise Old Man to a fight to the death. 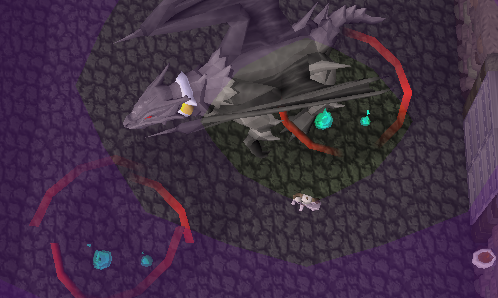 Accept her challenge, and then head over to the Wise Old Man in Draynor Village. 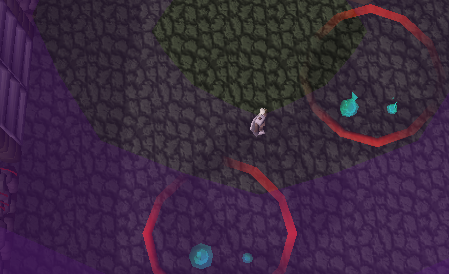 Speak to the Wise Old Man, and tell him Zenevivia has challenged us to a fight to the death, after that he will reminisce about his old days with Zenevivia. He'll tell you about how she stole his house, and how she is probably there now. After that, the Wise Old Man will step outside. Talk to him and tell him you're ready to go to Rimmington, he will then start following you. The Wise Old Man won't be able to enter his house, and he'll explain why. You'll need to modify a teleport tablet to gain entrance to his house. 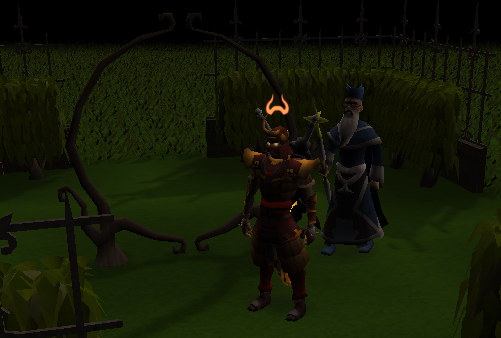 Grab a Chisel and go meet him in the house just east of the house portal. He'll give you some teleport tablets, and teach you how to chip them. Once you've chipped one, open the tablet. 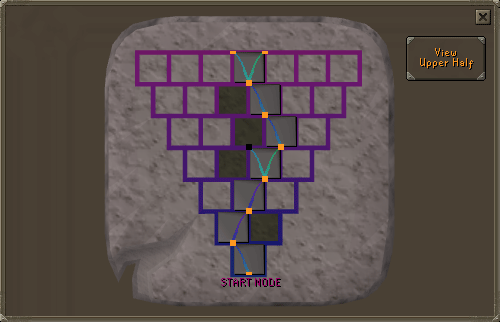 You need to move the conduit tiles on the left onto the grid to reach the upper half part. 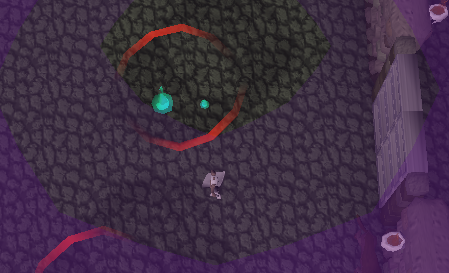 Once you reach that part, you must connect more conduit tiles to reach the destination zone. For the bottom half, it should look like the picture below. Now for the upper part, it should look like the picture below. 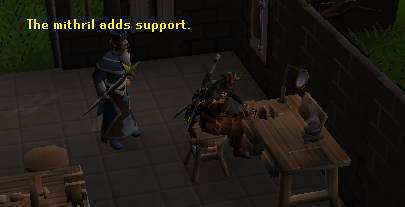 Once you've finished connecting the inside of the teleport tablet, use it to teleport into the Wise Old Man's house. When inside, you'll find out that Zenevivia has removed the safety measures within the house. So if you die, your grave will appear in Rimmington, and you'll respawn at your usual respawn location. 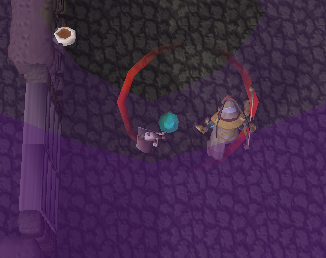 Go over to the Dungeon Entrance and have the Wise Old Man go in first. He will be hurt by a magical trap. 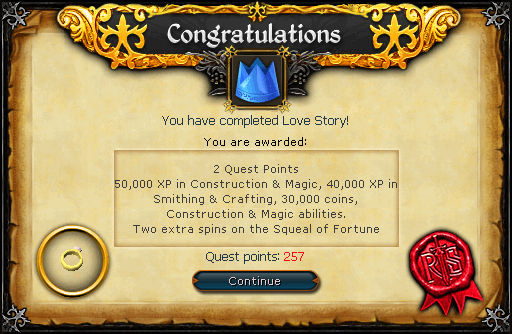 To break it, you will have to make something inside the crafter's workshop. 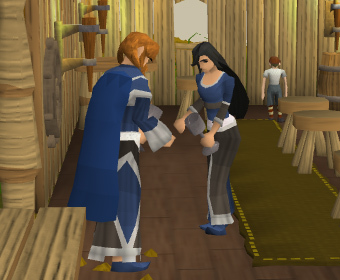 Ask him what you're going to make and he'll tell you that you need a Mithril Bar, 2 Oak Planks, and a Steel Bar or Clockwork Mechanism. Once you have all those things talk to him. The Wise Old Man will tell you to sit on the Clockmaker's Bench, and he will tell you what to do from there. 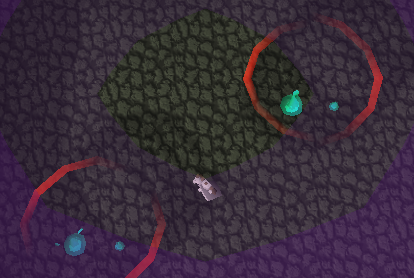 You'll end up making a Dummy, which will break the traps so you can get through the dungeon. 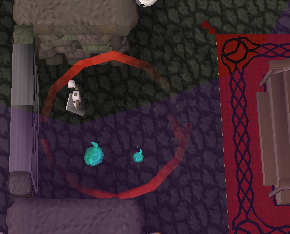 Right in front of the 1st door is a trap. The 2nd room contains two traps. The 3rd room contains two traps around the middle not too far from the north and west doors. The 4th room contains two traps, one near the south door and another near the middle. 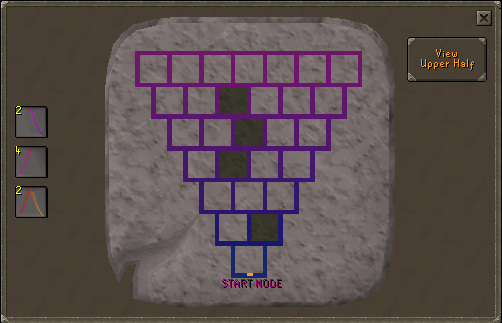 The 5th room has one trap near the west door. The 6th room contains two traps, one near the middle and another near the north door. The 7th room contains two traps, one in the middle of the room and another near the east door. 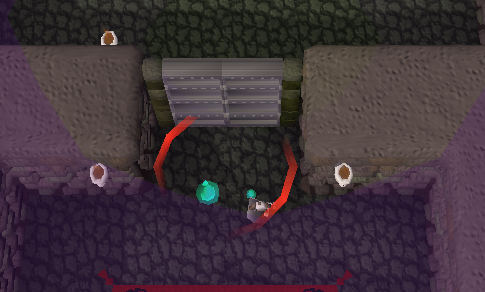 The final room contains one trap when you enter. Once you've had the Dummy find all the traps, have the Wise Old Man teleport him back, by attempting to have the Dummy go up the stairs in the final room. 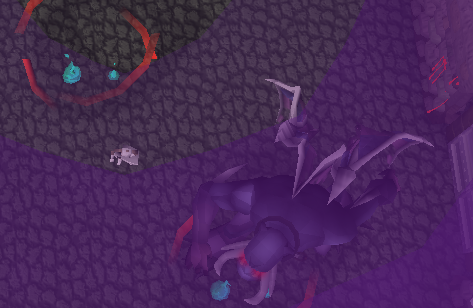 Now you can go into the dungeon and kill all the monsters without worrying about any traps. Before going up to fight Zenevivia, the Wise Old Man will tell you how he still loves her, and will try to talk to her. She won't listen to the Wise Old Man, so you will begin to fight her. When fighting her, she will cast magic attacks and make flames appear beneath you, when she does you need to run away so the flames don't hurt you. Keep your Protect Magic prayer on at all times, or she will cause major damage, and even heal herself on you with her spells. 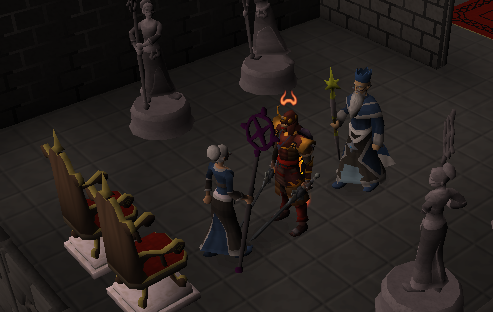 She will start to make the statues disappear and teleport onto the pedestals while she attacks you. Once on a pedestal she will alternate between praying against ranged and mage, so continue switching styles during the fight. You need to be constantly moving because she will make flames appear beneath you while up on the pedestal. Once you've inflicted enough damage while she's on the pedestal, she'll teleport off it. 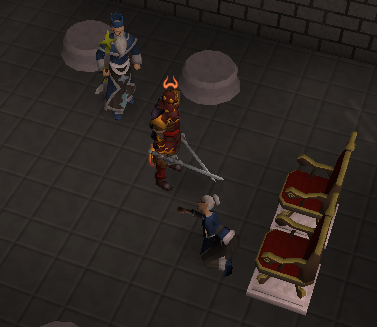 If you try to melee her, she will knock you back, so it is good to use a Halberd against her. Keep this up until she is defeated. Now that Zenevivia is defeated, talk to her. 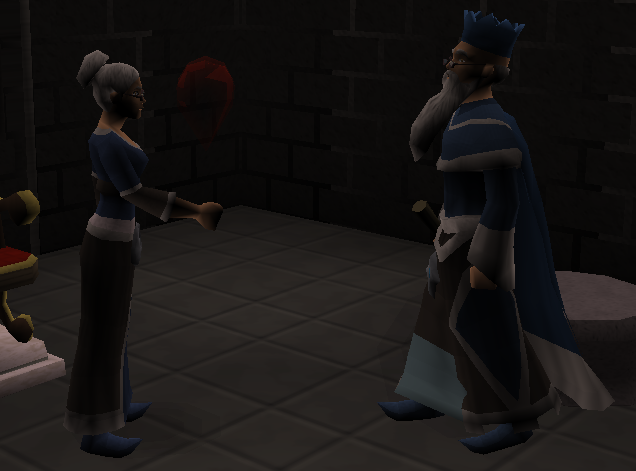 The Wise Old Man will tell her about how he robbed Draynor bank, and wants her to help him rob the Wizard's Tower. Afterward you'll appear back at the Wise Old Man's house. 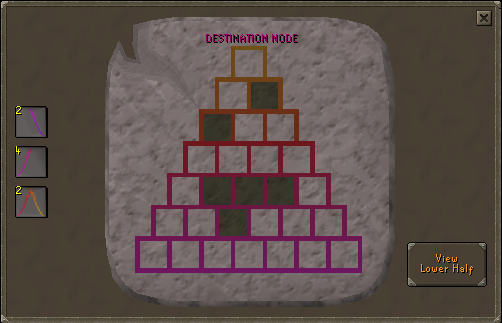 Talk to the Wise Old Man, and ask for a reward, he will tell you that they plan to rob the Wizard's Tower soon, and after that they'll reward you. Go upstairs and look through the telescope and you will watch them attempt to rob the Wizard's Tower. Go back and talk to the Wise Old Man, and they'll tell you that they're giving up crime as a hobby. Ask for your reward, and you'll get it.